December is the month in which social gatherings start to become a daily occurrence. For some it just creates unwanted stress and for others it’s their time to thrive. But what is clear is that the fundamental pillar of a great dinner on an important date is the gastronomy. Two of the most eagerly awaited events during this time of year is on the one hand, your Christmas company dinner and on the other, your New Year’s dinner. At OMBU, restaurant in Palma, we have designed two creative tapas menus that will ensure that your evenings be a success. Would you like to discover them with us? We will tell you all about it in this article. If you are still unsure about where to celebrate your company dinner, it will be good to know that at our restaurant in Palma you can enjoy such a celebration. We have designed two menus for you to choose from so that you can reminisce over the successes of your company. On the one hand, we have the Menu “Disfrutar”, a menu which is centred on the most creative tapas of Mallorca from our restaurant in Palma. A great option which you can pick at over the course of the evening. The desserts which are a fried ensaimada with crema catalana and a golden egg, will also be to share. And on the other hand, the Menu “Festival” offers half the amount of tapas to share, but with the added bonus that diners will be able to choose amongst a fantastic Cantonese entrecote with fried onions, mashed ají and black trumpet mushrooms or a delicious cod au gratin with honey pil pil, a spinach and ginger cream and a tomato vinaigrette with nuts as their main. What do you fancy, meat or fish? New Year’s Eve is, without a doubt, the most enchanting night of the year. Waving off the last 12 months of experiences with your most loved ones is a feeling like no other which can be very hard to recreate. That is why OMBU, restaurant in Palma, has created its New Year’s Eve Menu 2018. So that you always have that memory of that special night in which your emotions and an explosion of flavours came together in a stellar evening. This menu has a welcome cocktail which leads the way for our two shinning stars this year: our winners of the TaPalma 2018. Our Caminantes a Tailandia (TaPalma Gold 2018) and our False Paella Niguiri (TaPalma Bronze 2018) which have given us the most joy this year. 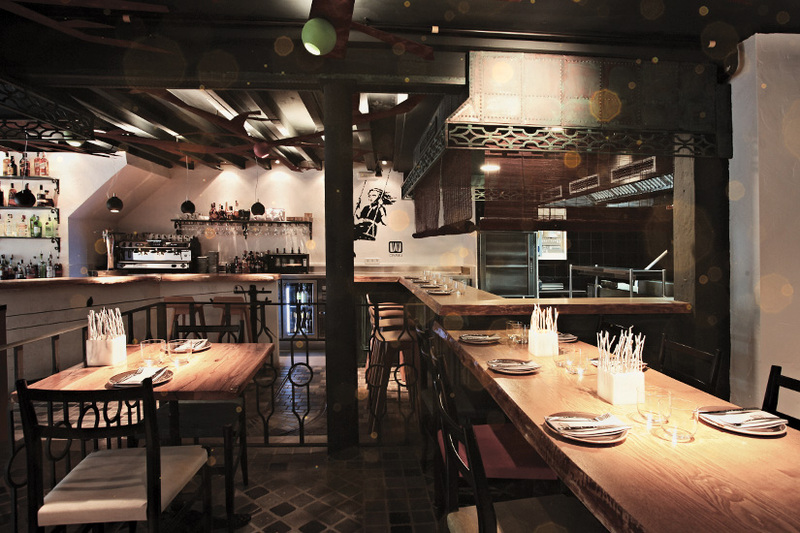 This is why, we want to give you this opportunity to savour these two incredible tapas. The menu continues with some macaroni with truffled carbonara, caviar and egg yolk in tempura, marinated and braised foie-gras with textured pineapple and a chocolate and hazelnut bread, pumpkin roll with a parmesan and coconut sauce, spices and nuts, the Hot Dog OMBU 2.0, grilled grouper with rustic mashed potatoes with a butter and turmeric foam and finally a Peking duck with a mango jelly and bitter almonds. Sounds tempting right? For us it is an all-round menu which encompasses this past year. In regards to dessert, we have opted to end this gastronomic experience with citrus bell peppers and the tree of life. An exquisite ending for such an excellent menu. In regards to the wines, the dinner will be accompanied by a Ocho Patas, Albariño D.O. Rías Baixas, and a Parada de Atauta, tinto fino D.O. Ribera del Duero. And of course we can’t forget…There is no New Year without the grapes or the bells. That is why our restaurant in Palma has prepared the good luck grapes and some great chit chat in a high class dinner celebration. We wanted to end the year with those who have brought us those unforgettable moments: all of you. Do you have any queries? Contact our restaurant in Palma and we can solve them for you. Also, don’t forget to reserve your table for these two special occasions. We can’t wait to celebrate with you! At OMBU we want to wish you a Merry Christmas and a very Happy New Year.